November | 2011 | eating with S.O.L.E. Maybe your one of those people who don’t really enjoy quinoa, maybe you think it’s too bland and fluffy, too mushy even. Well if so I will encourage you to try cooking it using this less water lower slower cooking method and see if you love how toothy and delicious it can be. I took a bit of a pilaf / risotto approach to this recipe, and I can’t tell you just how much I loved this dish! It was simply perfect. 5 whole roasted red peppers (I used canned Italian peppers) slice razor thin. simmer for about 30 minutes. until you start to get a nice chunky sauce. Now add 1 cup of quinoa and 1 cup of hot water, reduce heat and simmer on low for about 30 minutes uncovered, stirring often. After about 30 minutes you will notice the quinoa tails have sprouted but the grain still doesn’t look puffy… this is perfect! Have a taste and your notice immediately just how lovely the texture of this grain can be when cooked like this. 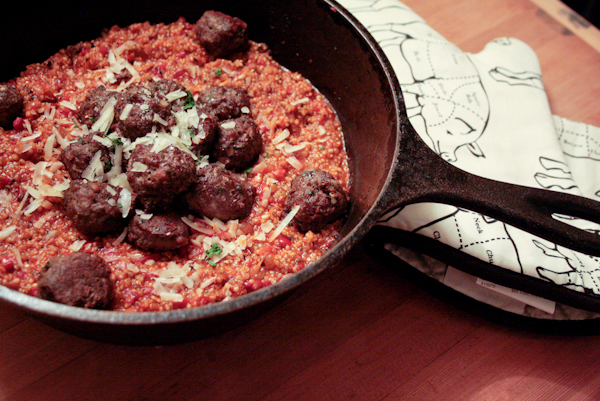 Garnish with fresh grated parm and parsley, and serve with these lovely mint meatballs for a very Mediterranean meal. The cake was a dense coconut sponge cake (I won’t share that recipe because it wasn’t my favorite yellow cake batter ever.. so you can use any white or yellow cake recipe you fancy). Each layer once cooled slightly was brushed with a simple syrup (1/4 cup sugar, 1/4 cups water + 6 tbsp spiced rum) then allowed to saok up the boozy syrup over night. I then made a old fashioned boiled white icing with coconut milk powder and each layer got a thick slather of ginger pear butter and coconut icing. 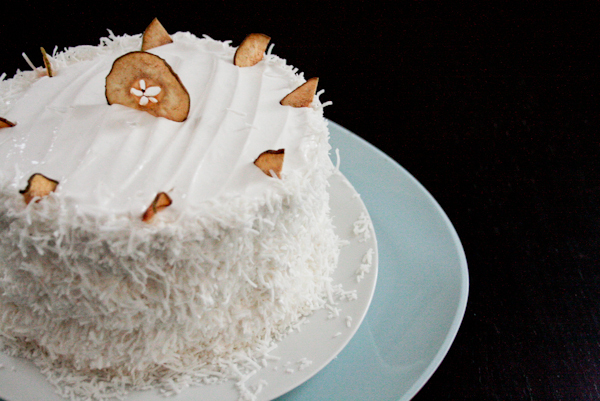 The whole lot was finished with the same fluffy icing then packed with fancy shread organic coconut and decorated with dried pears. This cake was like a tropical girlie drink on your fork! Once the syrup is ready, set your pot in a bowl of ice water to stop the cooking and slowly pour sugar into egg whites while mixing on low spead. Continue mixing for about 1 minute and your icing should have a pretty shinny marshmallow look to it. Add 2 tbsp organic coconut milk powder and gently fold in (you could add any flavour you want at this stange). It’s best to work fast and use the icing while it’s still warm. 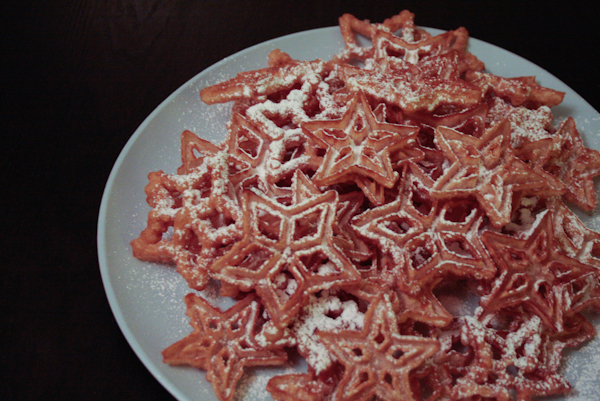 These crunchy, flakey, sweet stars are made using a vintage rosette iron that I got at a antiques store a few years back, and although one could eat these everyday, I make them only once or twice a year and only for the specialist of occasions. Last night was just such an occasion as we hosted some lovely friends to join us for “dessert in the yurt” … we celebrated my birthday and the completion of my new and fabulous studio / guest space.. “the yarn yurt”. The party was a pot luck spread of all things sweet and fabulous, and the buffet was plump with marmalade cookies, lime cardamon cookies, apple cake with blue berry sauce, very berry vegan crumble, chocolate chilli ice cream, a lovely avocado cream-cheese maple pistachio spread, chocolates, doughnuts, dried fruits and the piece de resistance… deep fried sugar coated rosettes. My grandmother would make these every new years and we would all just huddle around the deep fryer waiting for hot fresh dripping rosettes to come out and get a dusting of icing sugar. The very smell of these take me happily back to holidays long long ago. Not only are they stunningly beautiful, they are especially delicious! 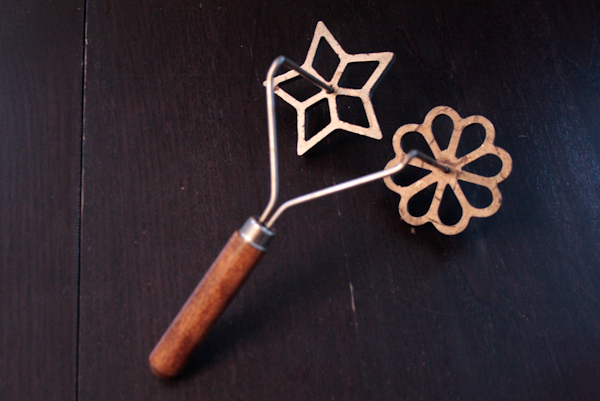 So you need to have a rosette iron for this task, and I am not sure you will find them new, so keep your eyes open in thrift shops and at garage sales for these. There are many many shapes that you can screw onto the tines, including some little cups which I keep thinking would be really nice filled with just about anything. blend and let batter sit and get up to room temp before using. heat a pot of oil or shortening to frying temperature . I insert a bamboo chop stick into the oil and when i see tiny bubbles coming out of the end of the stick I know the oil is hot enough… I think I learned that watching wok with yan as a kid. gently heat the iron before dipping shapes into batter, you should hear the dough sizzling onto the iron, be careful not to let the batter travel over the top edge of the iron or you’ll never get the doughnuts off. Dunk battered iron into oil for about 15 second or until the rosettes are golden brown, tap off immediately and let drip on newspaper, then dust with sugar and enjoy warm! BE CAREFUL… wearing dark shirts and eating rosette leave you with very obvious snacking evidence! My mother is a lot of things, and I love her dearly but a baker she is not! 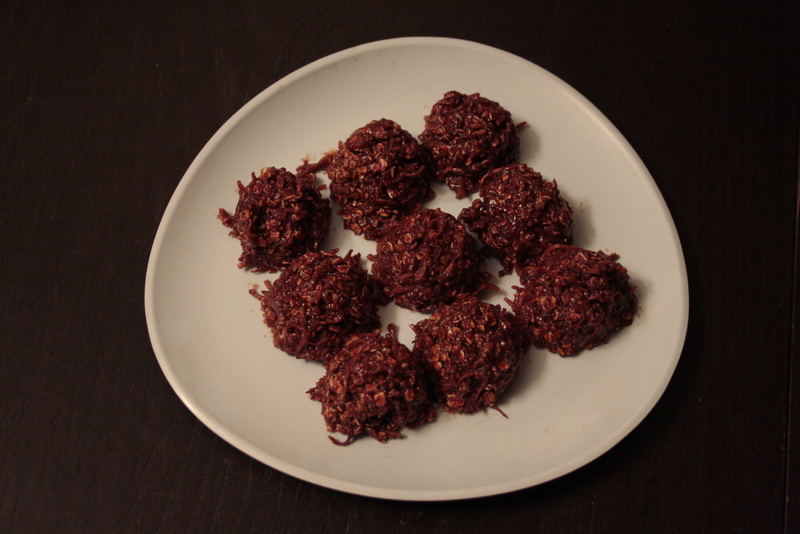 I think that oats delight is maybe the only trick up her baking sleeve, it is however one that brings back childhood memories, of sneaking these little cocoa drops from the fridge. This recipe must have been published in readers digest in the 80’s or something… because I think everyone’s mom makes something like it. 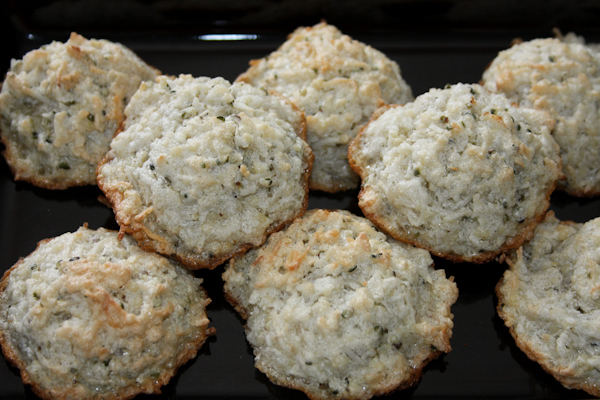 I have tweaked her original recipe to be less sweet and more wholeome, and in a pinch they are a great confection. Notice I called these a confection and not a cookie… that’s because I just don’t think that an unbaked or drop cookie is a cookie at all.. in fact I think that brings us to essential cookie element 4: the perfect cookie must be baked to be considered a cookie at all. Pour chocolate mixture over oats and mix well. portion cookies onto wax paper lined tray and allow to set in fridge for about 4 hours before serving. There is a symbiosis that occurs when making macaroons… they want to be paired with the making of an egg yoke recipe; like hollandaise sauce or egg noodles. The same day I made these I made lovely squash stuffed raviolis and cannelloni with home-made egg noodles and knew that those pasta dough egg whites were destine for great things. 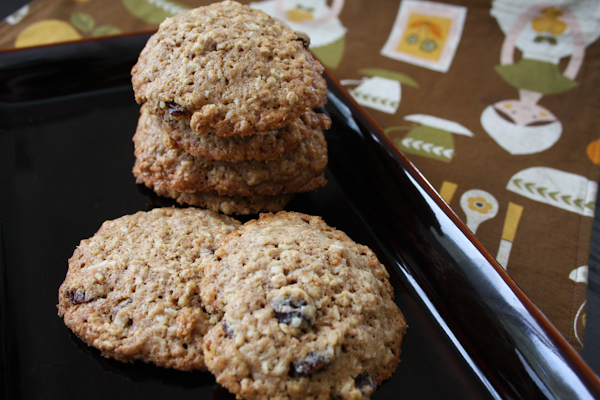 essential cookie element 3: cookies should be quick and easy, not fussy. Something you can throw together on a whim. the whites of 6 eggs just beyond soft peaks… on the threshold of stiff but certainly not hard peaks. gentally fold egg white peaks into bowl of coconut, until combined. Portion cookies on to a lined baking sheet and bake at 350 for 12 minutes. They are ready when golden brown along the edges and have some highlights of golden bits of top. thats it.. so very easy so very good. I adore fresh pasta, and make it no where near often enough but I recently took a trip to an Italian grocery and came home with about 6 lbs of “Tipo 00” flour (a belly aching total wheat indulgence for our house). This flour is the essential ingredient in pasta making, and although you can make this recipe using spelt or even quinoa flour the results will be no where near as perfect as they are with the “tipo 00”! There are some tools which although you don’t require, will help make your pasta making dreamy: a stand mixer, a pasta roller (hand crank is best) and a ravioli tray (I got one for the holidays last year and today was the virgin run). Yes you can do this all by hand using muscles, a rolling pin, and a knife and fork, but if you have the gadgets then might as well bust em out! I found my ravioli tray a little challenging to use because it makes mini pastas and I am a certifiable over stuffer so a few minor squash filling explosions aside I yielded some very pretty parcels… about 3 dozen of them in all. Had I had a little more patience this recipe would have yielded a feast and a great amount of ravioli for the freezer too, but as it was I ended up serving pasta two ways for dinner and settled on making stuffed cannelloni to use the balance of my dough and filling.. these were slathered in cheese and baked in tomato sauce, they were very nice but the raviolis, well they were divine in a smoky brown butter sage dressing. using a stand mixer or the flour well on the counter technique combine the flour and eggs into a crumbly mixture, not unlike bread crumbs. Then on a large clean floured surface begin to kneed the crumbly dough into a ball, which after some achy kneed-y minutes will become elastics and silky and shiny. Place your dough ball in a tighly sealed plastic bag and allow to sit in the fridge for at least 30 minutes. Don’t rush it or you will get hole-y pasta. Once your pasta is set cut into handful size sections and run through a hand crank pasta machine to the thinnest setting. The other night I roasted a whole spaghetti squash with olive oil, S+P and garlic. I served half that night and kept the other half for this recipe. You could use any type of squash, so long as you have 2 cups of it mashed and seasoned and ready for the filling. 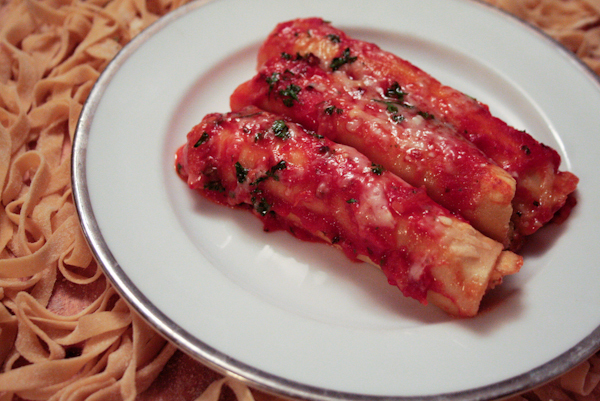 cannelloni : in a olive oiled pan place cannellonis and smother in a nice tomatoes sauce cover with parm and bake at 400 for about 25 minutes, then add more cheese and some fresh parsley and broil for 4 minutes. For this tomato sauce I used a method my dearest friend in Montreal taught me years ago; in a good amount of olive oil brown slivers of garlic until deep golden, then add 1 tin stewed tomatoes sliced razor thin, simmer, season and toss in pasta. ravioli: boil the raviolis until they float about 4 minutes in salted rapidly boiling water (in a overly large pot). Mean while in a small cast iron pan make a quick brown butter sauce: equal parts olive oil and butter, S+P, minced garlic, fresh parsley, dried sage, and for a smokey kick I added a tbsp of a locally made caribean hot sauce. 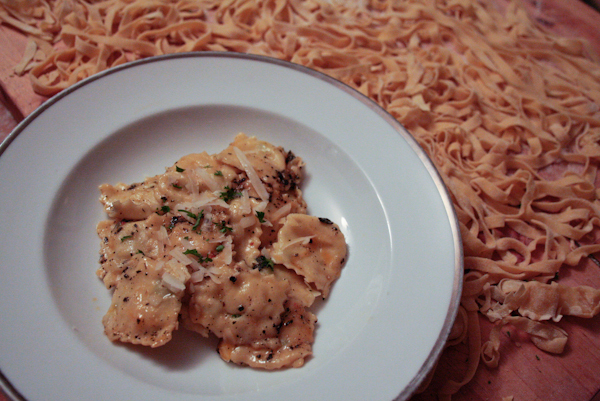 Once melted and browning, toss cooked raviolis in butter sauce and serve with fresh grated parm. YUM… we are all stuffed up and satisfied! Essential cookie element 2: the perfect cookie should highlight on the outside all the good stuff it’s full of on the inside. I am a fan of topping my cookies with bits of what is inside them; chocolate, nuts, seeds you get the picture. I think this is especially important if you are taking cookies somewhere like a bake sale or a party and they contain nuts… a big nut on top is a clear indicator that the cookie contains nuts. What I don’t like is seeing flat dark indeiscript cookies with dark little bits showing through here and there, leaving true cookie aficionados wondering what the heck is in there? Let me see a big ‘ol chunck of something to get my mouth watering. Today I baked off a number of these chocolate espresso vanilla cookies and I topped each with a few chocolate chips and a couple whole coffee beans *coffee haters and kids beware, the bean on top is a great shout out. portion and bake on a parchment lined pan at 275 for about 20 minutes, or until golden brown around the edges and set in the middle. perfect with a farm fresh goat milk latte! If you could only eat one cookie for the rest of your life what would it be? I would say poutine… but wait that’s not a cookie! 🙂 Seriously though I don’t know how to answer that, I think I am going to delve back into the world of cookies, and do a good run through of my favorites… trying to put my thumb on just what the perfect cookie is… all befor the holidays! I will start this adventure with my great grandmother. She is the very reason I ended up with a cookie shop and later and entire cookie factory. 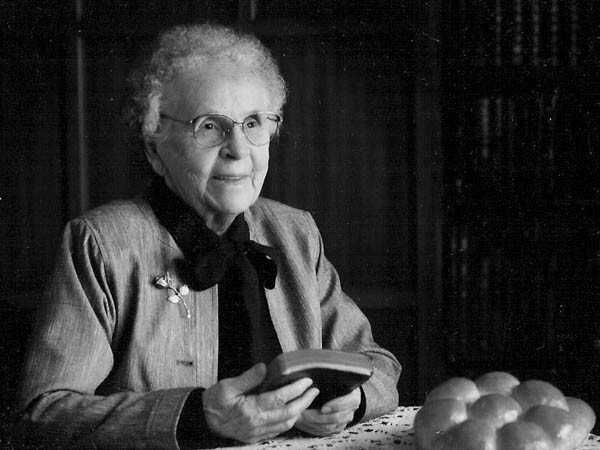 She was famous for her lovely white pull-a-part buns, sticky cinnamon buns and a number of now truly famous cookies, her cookie recipes were the foundation of my business, and allowed me to reach the status of “cookie queen-dom”. There are a number of cookies my old shop used to produce that I would indulge in on the rare occasion I was craving a cookie… but there is something very special about a select few of them, namely; oatmeal raisin, buttery shortbread and chewy gingerbread… and that is because these cookies smell like my great grandmothers house as well as my grandmothers house. These are the cookies I grew up with and the ones that have that special smell of home, and love and warmth (even after years of producing them commercially by the tens of thousands.) Those 3 are special. 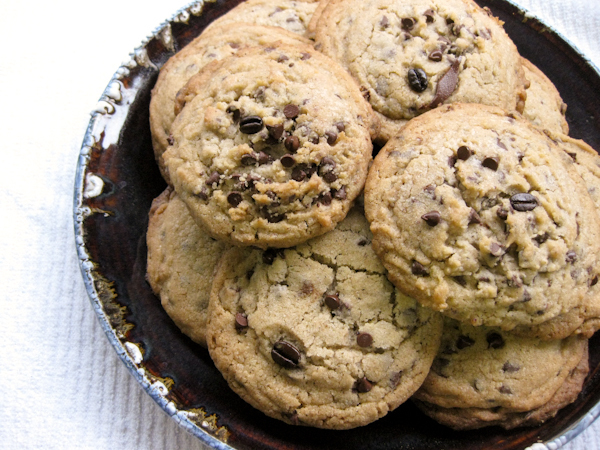 Essential cookie element 1: The perfect cookie should evoke a feeling of warmth and comfort, even recall an old memory. Today as I find myself in a silent snowy world, waking up to 4 fresh inches of pillowy snow I was drawn by the idea of baking and warming up my house from the heart of the kitchen. So this recipe is a tribute to my great grandmother, these are wholesome and not too sweet with a crunchy buttery outside texture and a delightful soft centre complete with the perfect spice combination. then portion and bake at 300 for about 12-15 minutes.. until golden brown! mmm the taste of home made love. I recently spent an afternoon driving an hour and a half away to do some ethic shopping at the local-ist Italian market, I came home with a pantry load up of all things Italian… olive oil, olives, pasta, cheese, salami … you can understand why after all that I just had to make a pasta dish… and I had to celebrate the very last of my garden fresh broccoli! This rosa sauce is thickened with boursin cheese and ricotta, and is flavoured with caraway and hot Italian local pork sausage, in a spicy tomato base served with baby lasagne style noodles. Meaty and full of fuel for a long night of building before the snow comes and decides to stay. and a good pinch of hot chilli flakes. bubble and brown once sausage meat is nice and golden de-glaze the pan with a splash of red wine. and a splash of cream, simmer on low for another 5 minutes. 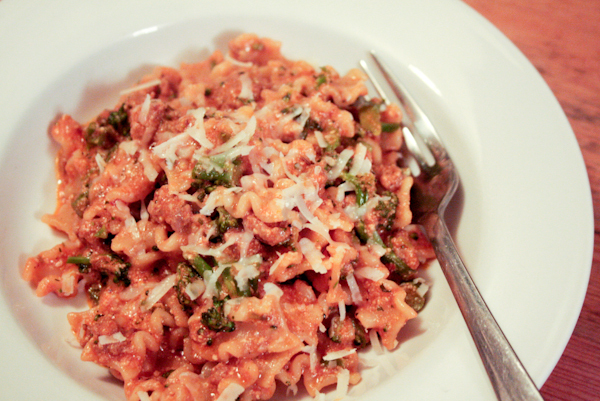 Once pasta is cooked strain and reserve about 1/2 cup of water to add into sauce along with noodles. 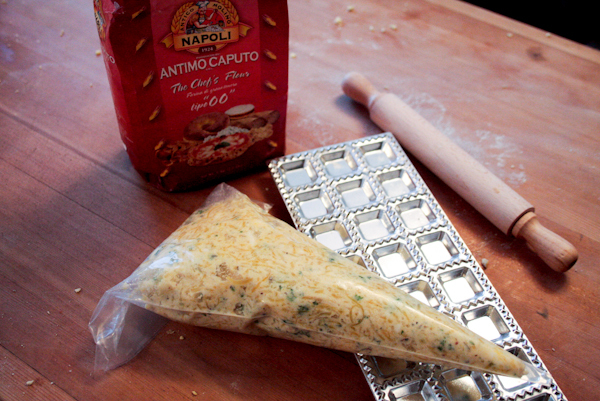 toss with a final glug of olive oil and serve with fresh grated parm. The caraway is my favourite thing in this dish… i just adore pork and caraway together especially with leek (a pretty classic English combination) turned itailan. 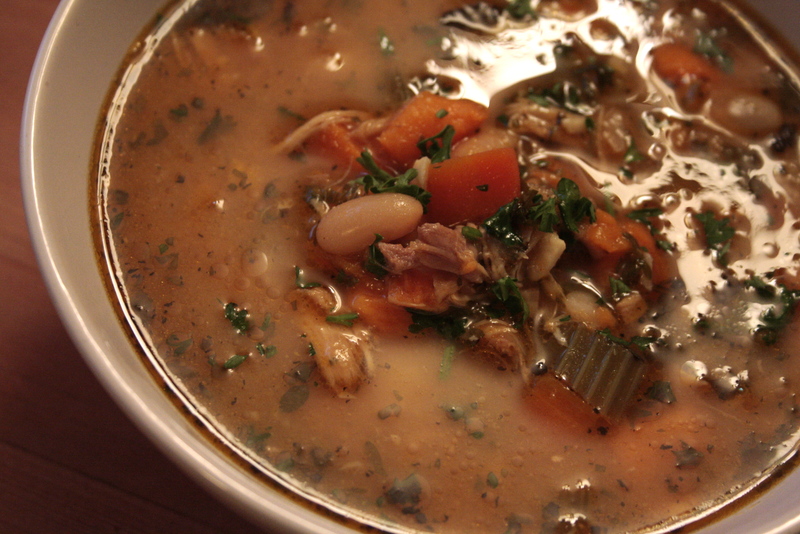 there are certainly days for quick and hearty meals and today was one of them. I was just barley able to get this picture taken.. as I had to fight off the family to keep them from dunking into this bowl for more kale chips! On this warm and wet Sunday afternoon my daughter was after something to keep her occupied so I challenged her to make her own kale chips (as she had been asking me for weeks to make some but I just wasn’t ready to give up the last of my harvest, at least not for a snack food that wasn’t always on the top of my favourites list!) 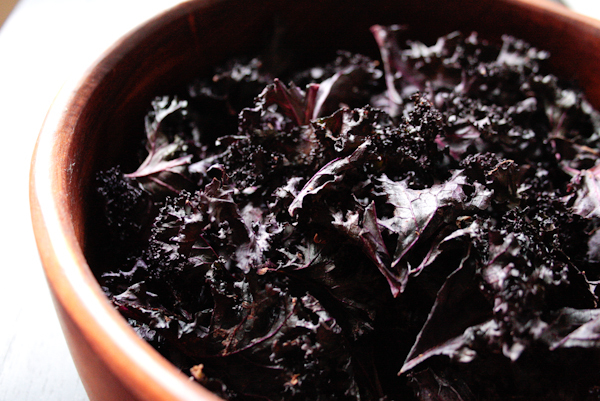 But when your 9 year old is begging for you to let her snack on more kale… how can you say no? Yum we all just loved the chilli hit at the end and the zesty bright flavours… and the whole batch is nearly devoured as I sit here writing not 10 minutes after removing them from the drying racks. The smell of ripening quince is unique… it’s a touch sickly floral sweet with a heavy citrus infused apple smell, defiantly prominent. 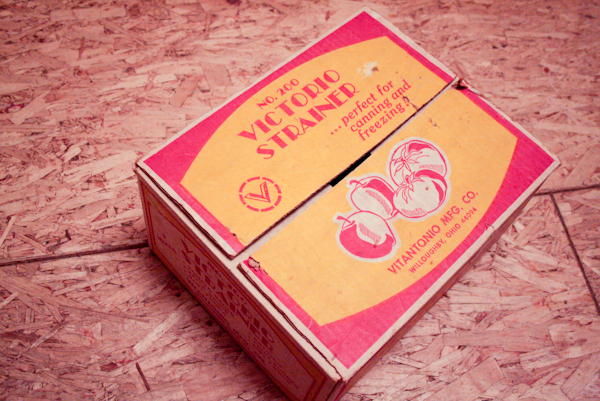 When I arrived at the greyhound station to pick up the 30 lb box of gleaned organic quince my amazing sister-in-law picked and shipped to me from the west coast, the guy at the station said… “is your box the one that has made our whole warehouse smell like apples?” Yes, indeed it was! These are funny furry apply pear like fruits that are very old world European. They can not be eaten raw, but there seems to be a few traditional ways to process them in to delightful edibles. Last fall I made quince jelly with my sister in law (the day before her wedding… which were used as wedding favours that looked so sweet yet didn’t quite set up entirely so it was more of a quince syrup, which was lovely all the same). My pantry still has a little surplus from that, my first ever experience with quince… so with this new flush of fruit had my heart set on new quince horizons… enter Membrillo. Served with sheep’s milk (Manchego) cheese it is an every day affair of delight in Spain. Quince paste reminds me of it’s Caribbean cousin the much adored guava paste which my West Indian girlfriends introduced me to back in high school. It’s oh so pretty pink flesh makes the perfect addition to any cheese platter. Thick and sweet yet still somewhat spreadable it is obviously why the other side of the world enjoys this as often as they do. It’s Delicious. Start by gently rinsing and scrubbing the yellow fur off a whack of fruit, about 30 pieces of similar size. Then set them on baking sheet and cover with an identical baking sheet (I do this simply because I don’t own aluminum foil, but if you do go ahead and user that instead). Slowly bake until tender through in an oven set to 350 for about 2 hours. Mean while in a small pot I half an entire vanilla bean and set it to steep in 3/4 cup of boiling water (from the kettle) along with a good splash of organic lemon juice. I set the pot on my back burner which when my vintage oven is on puts off a good amount of low heat and let it all just infuse while the fruit is baking down. Pour the puree into a heavy pot and add the vanilla lemon juice, remove vanilla pod but scrape the seeds into juice and stir well. Add equal amounts of sugar to puree. (I know your probably shrieking as I would be readying any jam recipe going “that is way to much sugar!!! better half it”) Well seeing as membrillo is a whole new venture to me I followed the direction of many many many a recipe I dug up and just matched it 1:1. If you are successful using less please let me know! On a low heat bubble and bring the mixture together for about 20-30 minutes stirring often. Pour the paste mix onto a baking sheet lined with baking parchment, using a icing knife or spatula flatten the mix and allow to set and cool for a few hours, then cut and sample! You can store the paste in food saver bags and keep it in the fridge for up to 3 months. I think this will make divine holiday treats for friends and the perfect home made addition to my next swanky spread. Wow this dish burned the mouths of my loved ones… while I enjoyed every spicy morsel… and as my world got doused in snow today the idea of peppery warmth with new Chinese flavours rolled over and over in my mind, and seemed like the perfect solution for a frustrating start to the wintery season. 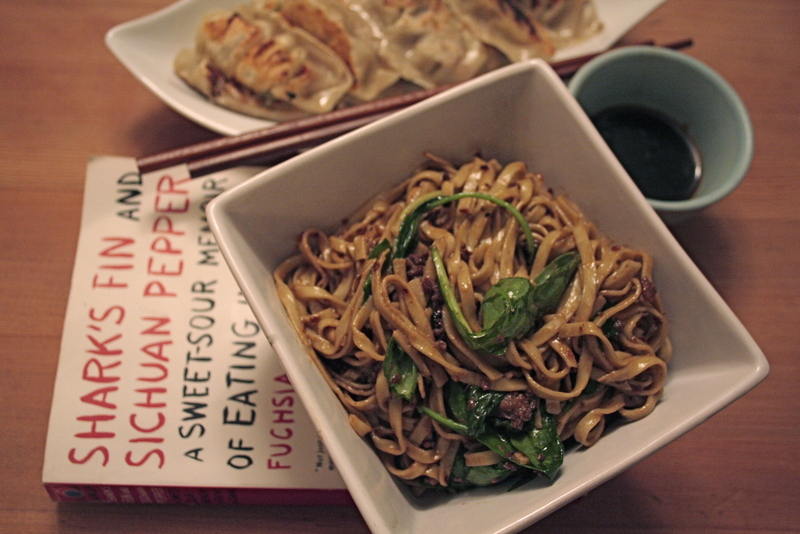 It’s all down to a great new book I started reading “Sharks Fin and Sichuan Pepper, a sweet-sour memoir of eating in China” by Fushsia Dunlop. The book it self is a bit of a conflict for me, as I never read in the day time, and I am not usually a late night snacker… but reading before bed about mysterious Sichuan dishes in mouth-watering detail is leaving me dreaming about pepper and meat and noodles and smoke, even wondering about the texture and taste of things like rabbit head and pig ear, and even jellied chicken blood! Dan Dan noodles mean shoulder pole noodles, which come from tradition of Chinese street vendors who carried noodles over their shoulders on bamboo poles. The storey of eating these noodles, steeped in Sichuan peppers was instantly appealing to me, and when I found a recipe to follow the chapter I was delighted. Not only did I get to play with entirely new spices and fermented flavours, but I realized just how much I can relate to wanting to eat foods that warm you from the inside when you live in a humid climate (which is still pretty new to me, coming from the dry prairies). I was really thrilled to go and make feta cheese with my back road buddy and goat herder / milk maid extrodonare. The process was pretty straight forward and involved lots of sterilizing and waiting around.. luckily we had wine and lots to gab about while we were waiting for the cheese to do it’s thing. I have made paneer and lemon / vinegar cheeses in past with some success but I had never used rennet or attempted a hard cheese before last week, and I think these feta’s are just darling, and darn tasty. We used 6 L of goat milk courtesy of miss daisy the lovely white Nubian goat you see above. We warmed the milk then added culture, then rennet and cold water, then I giggled like a little boy as my friend showed me how to “cut the cheese”, she was a pro at it ;). There was a lot of stirring in gentle figure 8’s (the same way I stir my risotto) then we portioned the beautiful curds which magically appeared into little baskets and flipped them often to allow them to drain and set. Her chooks got the whey and we were left with 4 lovely rounds (about 1.2 kg of feta cheese). After a night of draining she made a salt water brine, and the rounds have been steeping in that salty bath for a week. I just cut into my wheel as I shot this final picture and am enjoying a big ‘ol slice right now! YUM. Having goats is soooooooooo on my future agenda, seeing as I moved to the country to have goats and make cheese. I feel one tiny step closer to realizing that dream after my first feta lesson. And I am so grateful that their are so many charming goat keepers close by, all to eager to share some goat husbandry wisdom with me! I see feta recipes in my future… stay tuned. There is of course a general consensus that caesar salad is not good for you, and certainly a plate of roman slathered in shelf stable Kraft dressing, white bread croutons, processed parm, “facon” crumble and some nasty mechanically separated sear marked chicken bits does not constitute a salad, or food for that matter. Well this cleaner greener caeser salad makes up for all those food sins. I started with a fresh organic head of locally grown roman lettuce, topped with lovely garden fresh slivers of celery and shredded carrot. Then I add squares of organic local firm tofu quickly seared with S+P, chilies and a drizzle of maple syrup to finish them of to a perfect sweet and hot char. Quickly I toasted up a slice of bread (I used a organic sprouted wheat) and cut it into croutons, then covered the mound with grated sharp organic cheese, and finish the salad with a mountain of fresh parsley chopped fine. 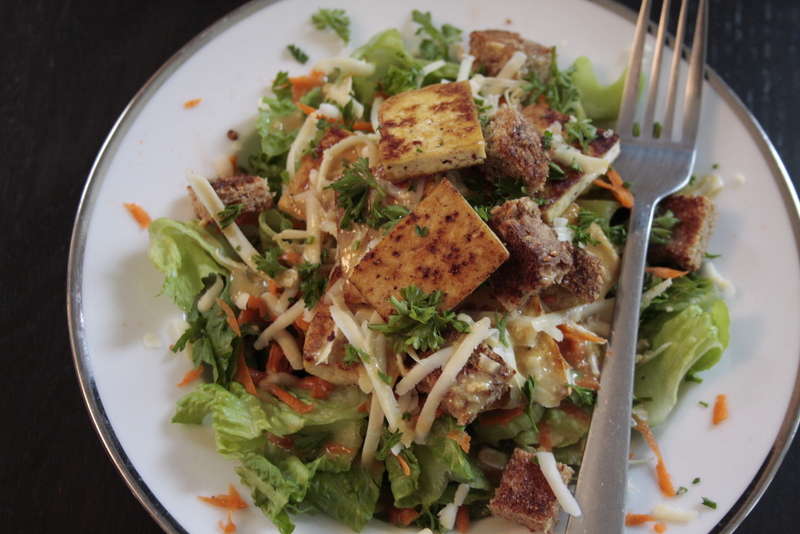 As for the dressing… I used my new favourite glory bowl dressing to which I added 1 tsp of anchovy paste to 1/2 cup dressing, this made for the perfect caeser sauce! Mmm a wonderful lunch for the first snowfall of the year! Tags: better for you caesar salad, caesar dressing recipe, greener caesar salad. garlic : Sulfur compounds in garlic kill viruses and fresh garlic has more immune-boosting potential than cooked, so in this soup I add fresh minced garlic at the end of cooking as well as throughout. sweet potato & white beans : both full of beta carotine an immune-enhancing food. Beta carotene is converted to vitamin A in the body, which is particularly helpful with respiratory infections. parsley : one of the world’s seven most potent disease-fighting plants and all to often under valued, and underused. oregano oil: this killer immune-booster is a virus and fungal fighter. and finally love, the most important healing ingredient of all!